The Brian Fisher family faced sudden devastation right in the middle of production for the popular TV show Flip That House. Fisher died suddenly from pneumonia and the episode came to a grinding halt. After a few months of no activity on the house, author Adrienne van Dooren came to visit the widow and offer support. 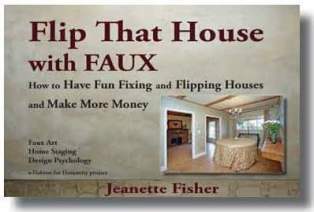 The author of "The House That Faux Built," van Dooren suggested to Jeanette Fisher a plan to turn the house into a Faux Flip. In an interesting twist, the Fishers, supporters of Habitat for Humanity, requested that Flip That House film the usual shopping spree at a Habitat retail outlet where home remodelers can donate and buy quality used and new building supplies. This was filmed before van Dooren met Jeanette Fisher. Van Dooren raised over $50,000 for Habitat for Humanity with her book and home tours of her Faux House in Alexandria, VA.
Van Dooren arranged faux art supplies from Faux Masters Studio in Yorba Linda. Local faux artists helped the Fishers finish the project, turning the flop house into "the house that love rescued." Besides the local artists, volunteers came from New York, Virginia, and Missouri to donate time, materials, and artistic talent. 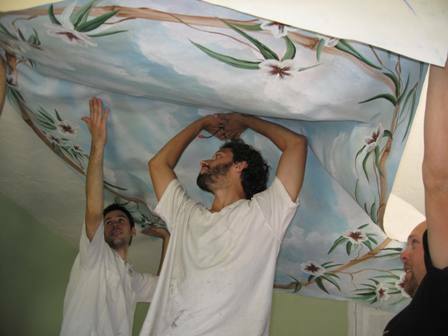 Mural artist Arlene Mcloughlin sent a gorgeous bamboo ceiling mural from New York. Decorative painter Kari Barron volunteered after the show was completed to add faux finishes to the office. 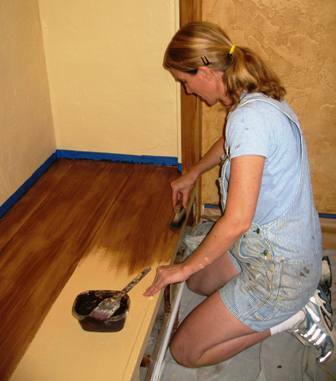 Jeanette Fisher, author of interior design textbooks and real estate investing books, wrote her first "color book" about the project featuring the artists and their faux finishes. "Flip That House with FAUX: How to Have Fun Fixing and Flipping Houses and Make More Money" will be released on the same day as the show premieres: Saturday, September 29.